Cucumbers, cultivated in India and Egypt for over 3000 years, were introduced to Northern Europe by the Greco-Roman culture. All Cucumbers seem to have originated in southern Asia and Africa. Cucurbits are tender, hungry, sun lovers who like to keep their feet in warm soil with ample moisture and good drainage. Pick a sunny location. Plant cucurbits in hills, drills, or mounds. cucurbits need at least eight hours of full sun each day. Give them a lot of room, horizontal or vertical, for their usually sprawling nature. 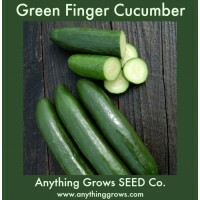 Cucumbers grown vertically will be straighter! They are not fussy about their soil, but, prefer a well drained sandy loam soil enriched with compost. Cucurbits have hearty appetites and love a deep mulch of compost. Renee's EXCLUSIVE - Our cucumber lovers’ reward, 12 to 15 inch Chelsea Prize is the same long, elegantly slender English cucumber found at a premium price in upscale markets. These thin skinned, bitter-free cucumbers are always easy to digest with absolutely delicious crispy sweet flesh and few seeds. The handsome glossy fruits are produced in abundance from every node of the vigorous, self-pollinating vines. 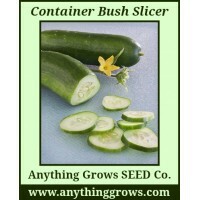 Enjoy them all summer in wafer-thin juicy slices for salads or cut into refre..
Container Bush Slicer Cucumbers are juicy slicing cucumbers that grow in record time on disease resistant, dwarf bushes. It is perfect for small space or container gardens. The 6 to 8 inches long fruits have smooth, tender skin and sweet, crisp flesh. Maturity 55 Days (approx. 18 seeds/pack). Maturity 55 days. START SEEDS OUTDOORS: Plant heat loving cucumbers only when spring weather is warmed and night temperatures are consistently above 55°F (13°C). Amend soil we.. Thin, tender skin, crisp flesh and a small seed cavity. Green Finger blew away hybrids in our trials for quality and yield. Unusually durable for this type; no wrapping needed! A field or open tunnel variety bred by Cornell University. Beit Alphas are similar to European/Dutch types but smaller. Gourmet Beit Alpha-type • 6-8” fruit. (Cucumis sativus). Maturity 60 days. Disease Resistance: Powdery Mildew, PRS, WMV, Zucchini Yellow Mosiac Virus .. Uniform fruits great for fresh eating or pickling! Compact, multi-branching vines climb easily; small leaf size makes fruit easy to see. 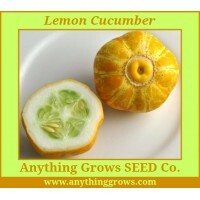 Great for field, greenhouse, or containers. Developed and released by the University of Arkansas in 1991. Plants produce fruit under stress and without pollinators, guaranteeing high yields. Maturity 58 days. Open pollinated. Parthenocarpic AKA:Seedless 3-4" fruit Disease Resistance: ALS: Angular Leaf Spot, AN: Anthracnose, CMV: Cucumber M..
Homemade Pickles is a great pickling cucumber. These vigorous, disease-resistant plants produce baskets full of perfectly shaped, bright green cukes with crisp and flavourful flesh. Pick at 4 cm. for tiny pickles and up to 15 cm for large dills. 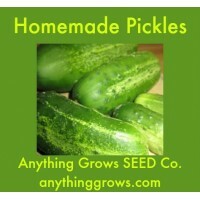 Use them to make tiny French cornichons or big garlic dills. Heirloom. Maturity 55 Days How To Grow Cucumbers grow best in a wind-sheltered site with rich, warm sandy loam. Sow seed when the danger o.. Specialty variety prized by chefs for its delicate flavor and crunchy bite. Round fruits turn from pale greenish yellow to lemon yellow (the best eating stage) and then bright golden yellow (when it most closely resembles a lemon). Easy to grow; does well in short seasons. Great for large containers. Tolerates cool weather • 3” fruits. (Cucumis sativus). Maturity 68 days. 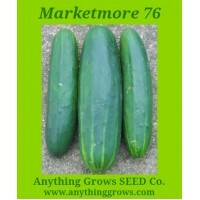 ..
Marketmore 76 remains the most widely-planted OP slicer in the US. Dark green fruits stay green and mild-tasting even under heat stress, while multiple disease resistances keep plants vigorous and highly productive across a long picking season. Shows good resistance to Angular Leaf Spot and Anthracnose in High Mowing Seeds trials. Vigorous • 8-9” fruit. (Cucumis sativus). Disease Resistance: Powdery Mildew, Cucumber Mosaic Virus, Scab. 65 days to maturity. 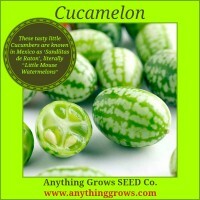 ..
Cucamelon AKA mouse melon, Mexican sour gherkin, Mexican miniature watermelon & Mexican sour cucumber. These tiny watermelons lookalikes have a refreshing flavour and bags of personality. Their lush vines will produce masses of fruit throughout the summer with a ‘cucumber and lime’ taste. They are ready when they are grape-sized and still firm to the touch. Easy to grow. Vigorous climber/trailer. Pest and drought resistant. Origin: Mexico. 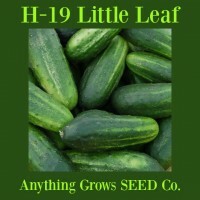 These tiny ..
Short, thick cukes with blunt ends are perfect for pickles and delicious in salads. Fruits have striped, medium green skin and a slightly tapered shape to fit in a pickle jar. A heavy producer with black spines. 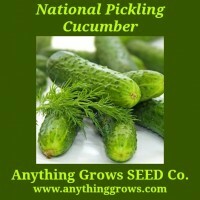 Developed by the National Pickle Packers Association; the cuke pickle growers asked for. Productive • 5” fruit. (Cucumis sativus). Disease Resistance: Cucumber Mosaic Virus, Scab. 52 days to Maturity. ..